The threatening sound can already be heard before the "decomposition" commences at the visual level. Parallel to the sound's intensification, white lines shift from the left into the black image space. As though we were viewing only one excerpt of a much larger spatial structure, a diffusely "luminous" rectangle moves up from the lower border of the image, while on the right border, an abstract figure dissolves into space-shaping forms. And here we have simply described the prelude to Manuel Knapp's audio-visual computer animation, which subsequently experiences an intoxicating increase in dynamics. Responsible for this is, for one, Zbigniew Karkowski's cutting, listening-habit disintegrating sound; and for another, the thoroughly complex visual (de-)composition that questions spatial and perceptive borders. Manuel Knapp hereby follows essentially very classical painterly rules when he makes use of the optical effects of light and shadow in building up or disintegration of surfaces, bodies, and spaces. One constantly has the impression that grids and layers of light continually shifting into and against one another are irradiated with light, and that individual bodies moving freely in the space are filled with light. 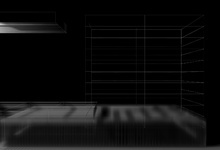 With the light-dark contrasts and light courses, Manuel Knapp brings, in addition, cinematic elements into the game: for example, the complex visual development is disturbed, in part, by diffuse shadows, transparencies, and also reflections, which fracture the potential precision of the linear, computer-generated structures.